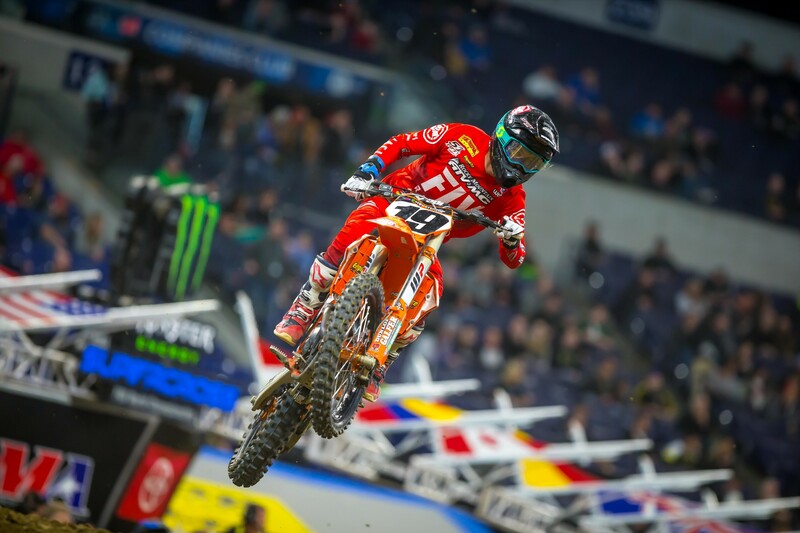 The 450SX field is still deep with factory-backed riders and big names looking for a breakthrough. Our own Steve Matthes combed the pits after the Indianapolis race to get some stories from riders and team managers off of the podium. “One of the hardest days I’ve ever had at a race. I was just out of sorts…and I have no clue why. I had a really good week, probably the best week I’ve had since I’ve been hurt as far as speed riding with Marvin [Musquin] and [Cooper Webb]. Just really struggled today. 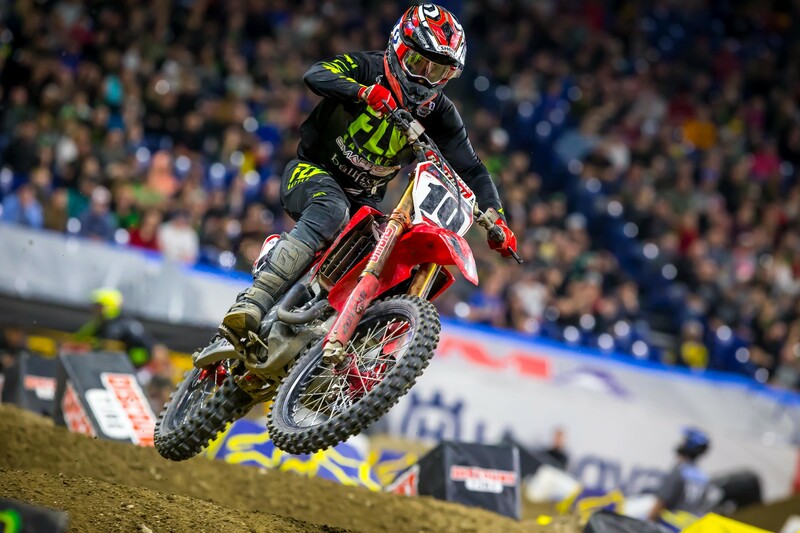 When the whoops are like those weird, flat, cupped things, I have a really hard time. It was just a mess and I was a legit 15th best in the practice. I had that very inside gate in the main, and I knew if I was going to do anything in that main event I had to get a start. I nailed the start, was maybe a little too cautious the early laps and let [Justin] Barcia dictate things with me, otherwise I feel like I could have been a solid fifth place, maybe even closer to points. I didn’t change my lines quickly enough in the whoops. “The way my night went, I’m feeling so much better every week, maybe not so much, but I’m making progress. My starts have been horrible, though, which is just blowing my mind. My start in the main was better, but I did terrible in my heat so I was way on the outside. I’m getting more time in me. I think I popped at 13 minutes this week and 17 minutes this week. I didn’t have any left at the end. I’m trying to find the silver lining—at least there’s progress. “A lot of things were going better today, A-Mart [Alex Martin] qualified second which was good, [Kyle] Peters was riding good. He [Martin] crashed early—nothing you can do, you have to go for it—but he came back to ninth which was good. Peters rode well but got tight at the end. 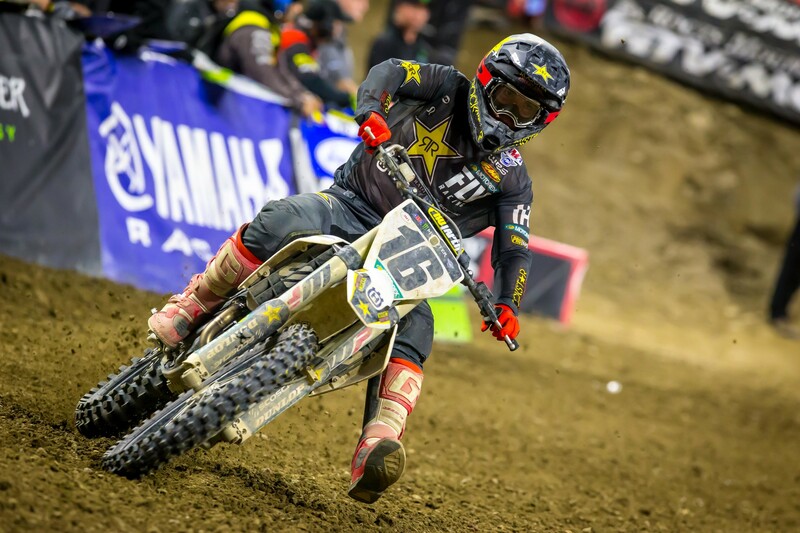 [Justin] Hill was riding really good all day, main event was riding okay, not like I hoped, but he was starting to get going. So there was a triple, he thought [Tyler] Bowers was going to triple, didn’t, he ended up going down and knocked the wind out of himself. [Chad] Reed rode super strong but he had a crash in the same area—[Cole] Seely hit him by accident, so they were 21st and 22nd. You look at lap times Reed rode great today. Hill told me he feels better every week, so he’s told me he’s excited about big things the next few weeks so he’s excited.